The Real Meat of the Matter | Our Farm by Earth Flora Inc. I haven’t been eating a lot of red meat for years (well, except for an occasional big fat juicy steak.) With all the articles on fat and heart disease, the inhumane treatment of livestock, and the mammoth carbon footprint of animal feedlots, a supposedly conscious consumer (who wants to keep the fats off) shouldn’t dream of eating so much red meat, right? I mean, red meat=saturated fat=clogged arteries=heart disease right? Still, I had to indulge a few times, especially since I ironically married into a family of farmers and cattle ranchers. However, early last year, we started hearing about grass-fed beef. I didn’t think much about it. In fact, I even asked my husband, “Why the need? Don’t all cows eat grass? Surprisingly, he said, “most don’t” and he began his treatise on beef. Here’s the rundown: I will just discuss three of the most common kinds of beef in the Philippines: (1) Local grain-fed; (2) Imported Beef; and (3) Local grass-fed. The kind of meat we have in the market, the meat we grew up with and have grown to love, and what ends up on our table, has a lot to do with economics or the business of meat. 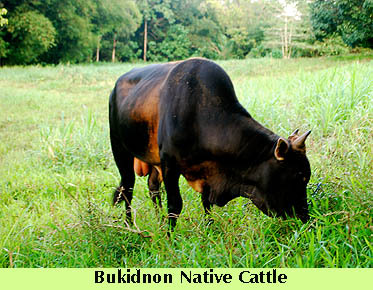 Almost all cattle operations in Luzon (except for some dairy and breeding operations) raise cattle for the supermarket trade. Supermarkets pay a premium for beef and thus farmers who sell to these markets are able to get more money for their meat. However, supermarkets will only get meat that measures up to a certain weight. This is so that the supermarkets are able to maximize meat to bone ratio. And, since the supermarkets will only accept this bulky weight, farmers have to make sure that their cows weigh at least 420-500 kilos when they bring them to the market. Now, to get to this weight that supermarkets will buy, the cattle farmers will have to fatten their cows. If they left the cows on its natural diet of grass and allow them to leisurely graze, they won’t get the required weight in time and so they lose on the sale. How do farmers make sure they have fat cows in a short time? They fatten it up with grain and grain by-products. Cows are kept in feedlots and fattened up with grain. Since grain is quite expensive in the Philippines, they substitute also with grain by-products such as factory food rejects, brewers’ grain by-products, sweepings, and the like. How much grass does the cow actually eat? It varies from farm to farm. The bigger the farm, the more capital it has to supplement with grain. Smaller farms cannot afford a lot of grain or by-products. On the average, local fattening operations use about 60% food concentrate and 40% grass. Economics dictate: the bigger and faster, the better chances at the supermarket. Farmers are often forced to implant growth-inducing hormones to make sure the cows are fattened in record time. The steak we grew up with and love to eat, that fat juicy one with the white marbling, those come from imported breeds like Angus and Hereford. These are the breeds that are able to put on more fat. 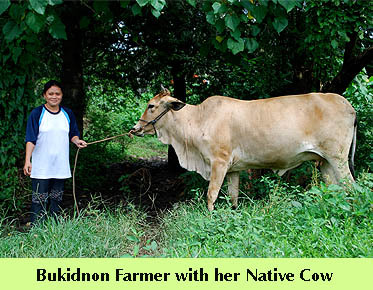 The cows are raised in large farms with highly mechanized farming operations. These cattle operations have a farmer to cattle ratio of 1:100 up to 1:1000 heads. That means having only one farmer to 1000 cows! The U.S. also heavily subsidizes grain and thus cattle farms are able to get very cheap grain to feed livestock. (They also have to feed during the winter or a drought using grain.) They feed cattle more than 90% grain. Now, since the cows don’t feed based on their natural constitution and on the pace that they should, they easily get sick. Farmers then have to give them antibiotics. They are also implanted growth-producing hormones. Not only that (this is exactly where the vegans bellow: animal cruelty!”) they are dehorned so they can be easily handled, and castrated so they gain weight much faster. Also, the calves do not stay in the farms for long. Farmers send the calves off to feedlots when they are only 6-8 months of age. They do this so they keep their pasture free for producing more cows. Note that a large percentage of imported beef comes from dairy operations and dairy operations generally use more supplements like milk replacers and medications for young calves. 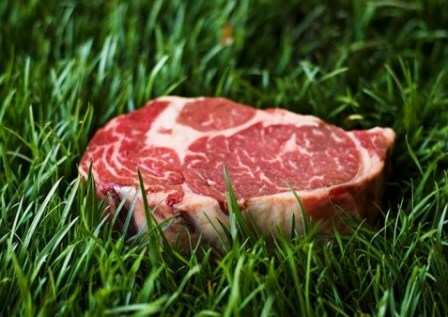 Local grass fed beef used to be the beef no one wanted to sell or buy. For the large-scale farmers, it was simply not economical. For the consumers, there was not enough fat! But with the increasing consciousness on the benefits of grass fed beef (good fat, high in Omega 3 and CLA, and leaner than skinless chicken), it has since climbed up the ranks and has now won a niche market. 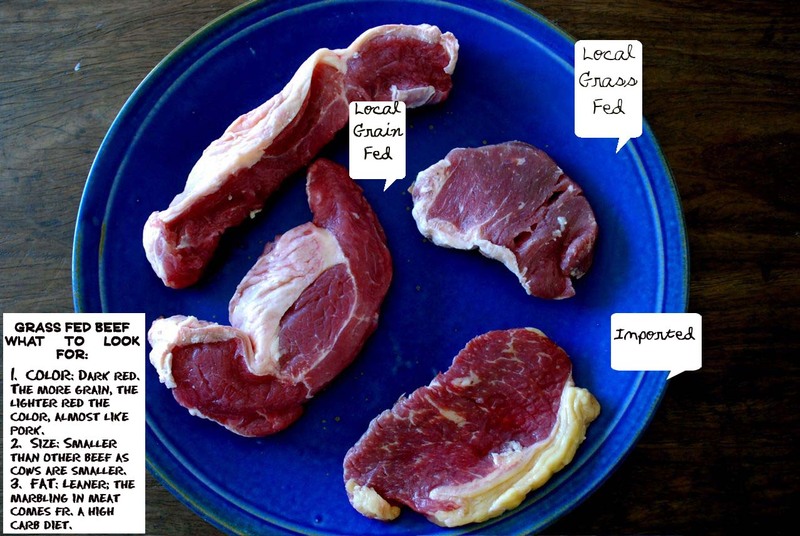 Local grass fed meat comes from very small farms, mostly family farms. The breeds are of the Indian breed, which are hardy, suited to our tropical climate, and leaner than the temperate breeds. The farmer to cow ratio is usually 1:1 or 1:2. Small farms with a few cows don’t need extensive land, fertilizer, pesticides, or heavy equipment. The cows do the work. They are tamed almost like a family pet. This is again, the most practical thing to do. Tamed animals are easier to handle. The family farms will also not feed it anything but grass. Feeding it grain is overly impractical, almost absurd. With the amount of rainfall we get, green grass is readily available all year round. So the cow feeds on grass and lives outdoors, in the pasture. The cow is not dehorned or castrated. There is simply no point in doing so. Also, they feed on their natural diet of local grass, building up their immune system so there is no need for antibiotics at all. Eighty percent of local grass fed cattle at their market age, will only weigh between 320 to 350 kilos live weight, way down the mark of supermarkets. The smaller animals get slaughtered in the local wet markets because the cost of transporting them to major markets is too expensive (Cost of shipping a 320 kilo cow is the same as the 500 kilo cow.) The remaining 10% (those with better weight) are sent to a fattening operation in Batangas to be finished on a ration of grass and grain by products. So there you have it, my article about how they beef up your steaks, and where the real beef is.